This may come as a surprise, but methods of tooth replacement similar to dental implants have been in the works for hundreds of years. Long before we had a viable technique to restore the fullest degree of function after tooth loss, humans recognized the important role played by tooth roots. They attempted to replace teeth and their roots with fixtures made from shells, and even from cadaver bone. Fast forward many centuries, and you can feel oh, so fortunate to live in a day and age when we can replace teeth and their roots, and we don’t rely on shells or bone to do so. Here’s the thing. Dentures have been the go-to treatment for tooth replacement since most of us can remember. The techniques and materials that are used to design and fabricate dentures have improved, facilitating an end result that looked a heck of a lot more like natural teeth than what our grandparents wore! Still, dentures fall short. There’s no way around it. They don’t fall short because of poor planning, per say. They fall short because they lack the design element that mimics natural oral anatomy. Basically, they lack roots. Roots are necessary for maximum stabilization. Your natural teeth stay put because their roots tether them to the jaw bone. 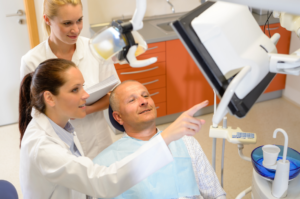 If you need a replacement tooth, it also needs to be tethered. Otherwise, you will notice that stability has decreased. Instability, no matter what the extent of replacement (one tooth or all teeth), often leads to changes in the way a person chews, or their food choices. If a denture slides across the gums when you try to chew a steak, the resulting soreness in gum tissue may cause you to rethink your future meals. Many people find that the discomfort they experience with conventional dentures leads to a limited diet, and therefore limited nutrition. Some even say their desire to eat has decreased noticeably due to discomfort. It is roots that encourage the regeneration of bone tissue. Without these structures, the height and density of the jaw bone decrease bit by bit. At some point, these changes affect the positioning of the lips, chin, cheeks, and nose, making one appear older and less healthy. We are proud to offer dental implants in our Walnut Creek office. Schedule your visit at ( 925) 937-9017.